← Why are you waiting? Be you – just do it! A simple project with fruit – a tutorial for fun! This tutorial will show you how to photograph fruit in all its glory – in a unique way. There are ways you can make the project your own with plenty of room for creative ideas. It is an easy project giving you some useful tips for still life lighting and working with a high key background. Have fun! Pick a good firm, clean orange. 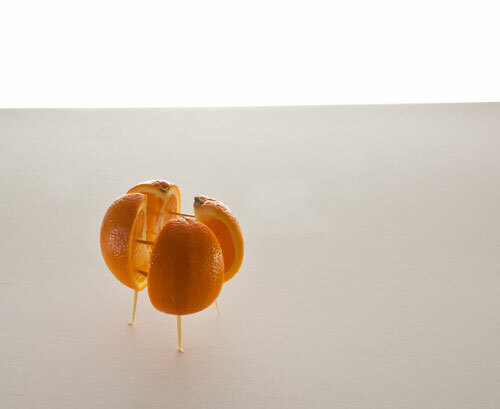 Assemble the orange in an “exploded view” using toothpicks. 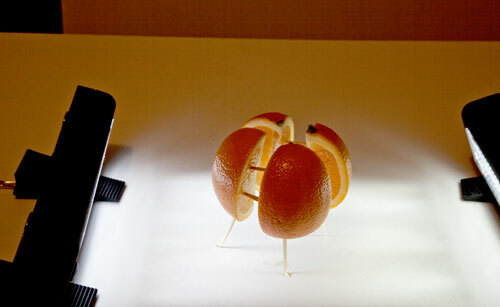 Create lighting to show off your orange without highlights. Finally you will clone out the toothpicks on the computer. Be careful, make sure that your orange is nicely shaped, no odd depressions or bruises, and as firm as possible, not over-ripe. Check the skin for consistent colour too. 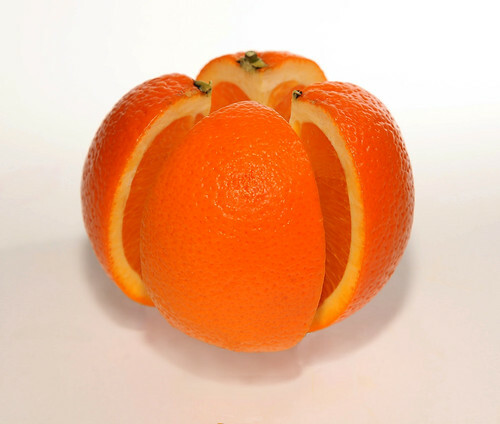 You want your orange to look delicious. No one will be interested in your shot if it is damaged, dripping and discoloured. Also, wash and gently wipe the skin before starting the tutorial. The skin should look bright and clean. Dirt, hairs and marks will really draw the eye of the viewer. Don’t let them be distracted. Cut it in four pieces top to bottom (two cuts). It helps not to have too many cuts. Cut carefully and accurately. If you hack the orange you will be adding distractions to draw the eye. Be careful and slow to ensure accuracy. Once cut we are going to assemble the orange in an “exploded view”. That is the term used to describe an “almost” assembled item that is floating in space so you can see how it would assemble. To hold the pieces apart I arranged the quarters using tooth picks. In the picture below you can see how the orange is braced with the toothpicks. The picture also shows how the back lighting is set up. You can see from the picture the orange is held firmly together by the toothpicks. It is also supported by four toothpicks as legs. We want the orange to be slightly off the ground so it has the feel of an independent object in space. The white card under the orange extends to the edge of a table. On a chair a little way back from the table is another upright card. You can see the white back-card is very bright. I used a strong light under the table to illuminate that card giving it a high-key brightness. There are some links at the end to explain more about high-key effects. We want to take the final shot with a little shadow under the orange. This give the impression the orange is floating in space. I will light the orange from the front with a flash. You can use the flash on your camera. However, that will create a very sharp shadow since flash is a very hard light. This means very harsh, sharp-edged shadows that will be quite dark. In the next picture you can see how I created some under-lighting below the orange to soften the shadows created by the flash. I have two cheap Rolson 61770 72 LED Camping Lights . These are really flexible for table-top still-life and can be easily set up for fill light. They are great lights and affordable. If you only have a pop-up or on-camera flash then you should find a way of diffusing the light from it. Alternatively you could create a diffused reflection. You should be trying to find ways to prevent the flash pointing directly on the orange. Bright highlights would be created that are distracting and ugly. Once the lighting is set up to your satisfaction you need to position the orange for the final shot. It is important to spend a little while positioning the orange so it obscures as many of the toothpicks as possible ready for your final shot. The final position ready to photograph the orange obscures as many of the toothpicks as possible. Then there is less cloning work to do on the computer. You can see from the picture that the orange is positioned so most of the internal toothpicks are not visible and the legs are minimised. Once the shot is taken we are going to clone out the remaining sticks. So if you have less showing you have less cloning-out to do. Now you are ready to take the shot – shoot it! Make a few attempts. Do plenty of chimping to ensure you have the lighting right. Pay special care to minimising highlights on the orange. When you are ready you can download your shots to your computer. The remaining work is to clone out the toothpicks. You will need to very carefully clone the white surface around the legs over the legs themselves until you can not see them any more. Pay attention to any shadows so that they remain realistic and consistent after your cloning is finished. 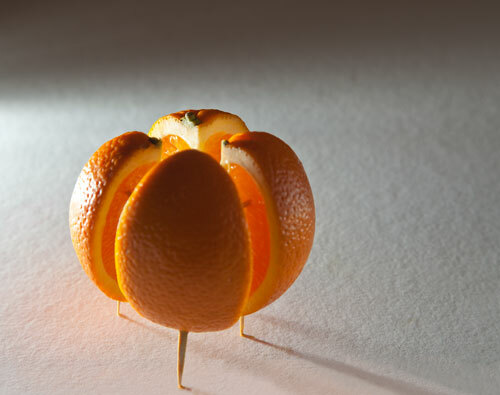 When cloning over the toothpicks in the orange interior use the same coloured flesh of the orange to clone out the remaining toothpicks you can see. If you are not familiar with cloning techniques you can see a tutorial here: Getting Started With Cloning. 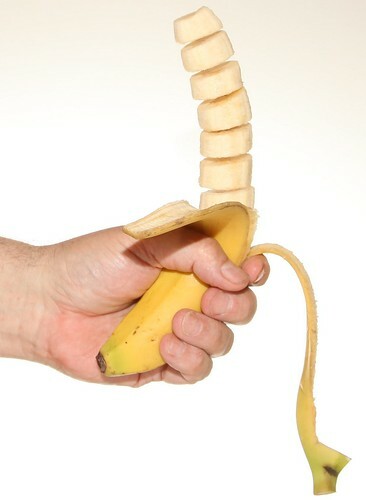 If you want to try other ideas here are a selection of other fruit-cut pictures below. All done using toothpicks or cocktail sticks. There is an infinite variety of things you can do using this technique so have lots of fun! The banana slices were held together with cocktail sticks while the shot was taken. Then they were cloned out afterwards. A half pear was sliced and held in the exploded view with toothpicks. 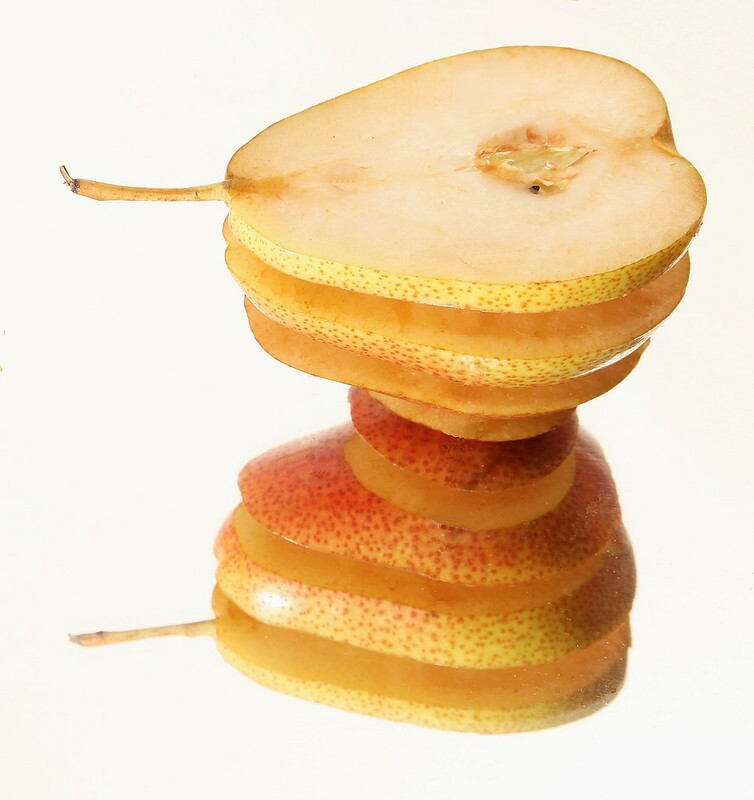 However, the pear was on a mirror – giving the effect of an inverted pear. 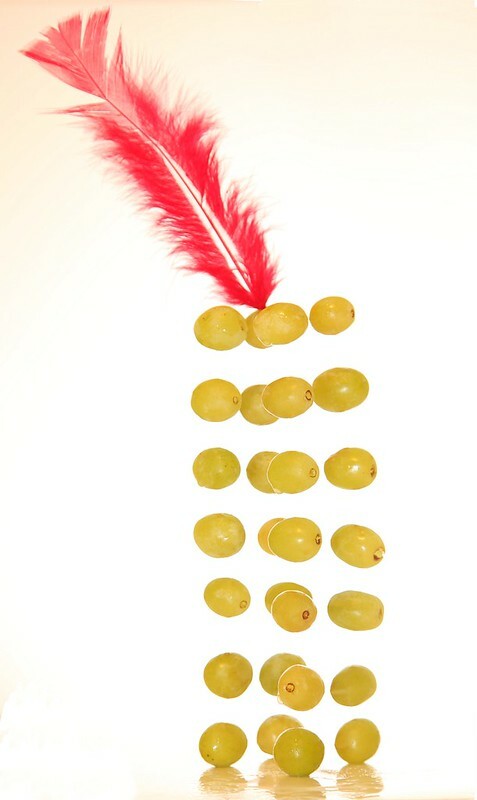 Each grape was painstakingly held apart using cocktail sticks. 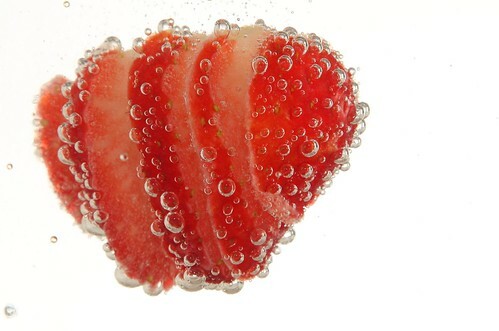 The strawberry has been sliced and held together with toothpicks. Then it has been placed in sparkling water to create the bubbles. This entry was posted in Camera control, Composition, How to..., Light and Lighting, Things to try, Tips Tutorials & Techniques and tagged Banana, Cocktail sticks, Creativity, Fill light, Fruit, Fruit and light, Fruit ideas, Fruit photography, Grapes, hard light, Home studio, How to Shoot, Ideas for photographs, light and lighting, Orange, Pear, Photographing fruit, Project, shadows, sliced, soft light, Still Life, Still shots, Strawberry, Table top photography, Toothpicks, Tutorial. Bookmark the permalink. Great, glad you enjoyed it.